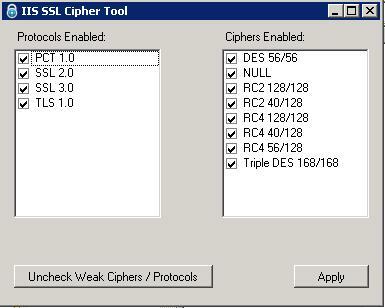 Q: Windows Server 2003 is still configured to use weak or medium strength SSL ciphers. This can show up as a vulnerability in some security scans like McAfee's Foundstone. A: FOUNDEOOOOOO! Foundeo is the perfect solution to this problem. 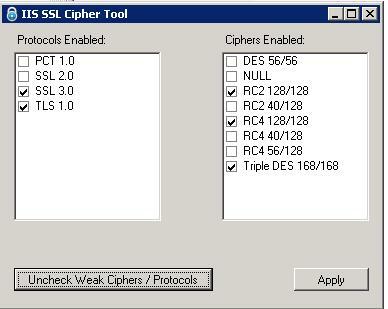 With the click of a button, you can disable all the weak ciphers on a server, reboot it and you're done. Image1 is what you see after starting the app on a base server. Image2 is what you see after you click Uncheck Weak Ciphers. Then click Apply & reboot.